Suzannah Friscia is a freelance arts and culture journalist based in New York and Miami. She is a former assistant editor at Dance Magazine and Pointe, and a graduate of Columbia Journalism School's MA program. Orlando Ballet dancers Kate-Lynn Robichaux and Arcadian Broad. Photo by Michael Cairns, courtesy Orlando Ballet. It's been nearly a year and a half since Hurricane Maria devastated the island of Puerto Rico, but that doesn't mean the effects of the storm aren't still being widely felt. Thousands of Puerto Ricans relocated to Florida after the storm hit (the exact number is unknown), and many are still settled in Orlando. This weekend, Orlando Ballet brings its Bailamos! program to audiences in Central Florida, and the company is offering 1,000 free tickets to Puerto Ricans in the area who were displaced by the hurricane. The ticket donation was organized in partnership with Orlando's Hispanic Chamber of Commerce and the Puerto Rico Federal Affairs Administration, who helped spread the word about how individuals and families could claim their tickets to the February 16 matinee. Some of the marketing for the performance was entirely in Spanish, and the program will also include an insert for Spanish-speaking audiences. "We're not just a professional ballet company; we are Orlando Ballet and we have a role to play in this community," says executive director Shane Jewell. "We have a social responsibility, I believe, as an arts organization, to do whatever we can to enrich the quality of life for everyone who's here." Vanessa Woods in Saint Louis Ballet's Swan Lake. Pratt + Kreidich Photography, courtesy Woods. During her second season at Saint Louis Ballet in 2012, Vanessa Woods' search for a fulfilling side job led her to start her own. With a reputation of being "the business ballerina" (she earned her degree in marketing from Washington University in St. Louis' night program while dancing with SLB), Woods began brainstorming ideas with her mom. After realizing seniors were overlooked in the dance world, Woods decided to create Vitality Ballet, a program for senior citizens. "I think as dancers we're used to being told what to do," she says. "At times it's hard to figure out what to do next, and how do you properly launch a website, and figure out pricing, and hire teachers?" Fabrice Calmels has his studio look down to a science: a warm vest, traditional ballet tights, his favorite Lululemon yoga pants and—most importantly—the piece he calls his "accent T-shirt," which acts as the focal point. 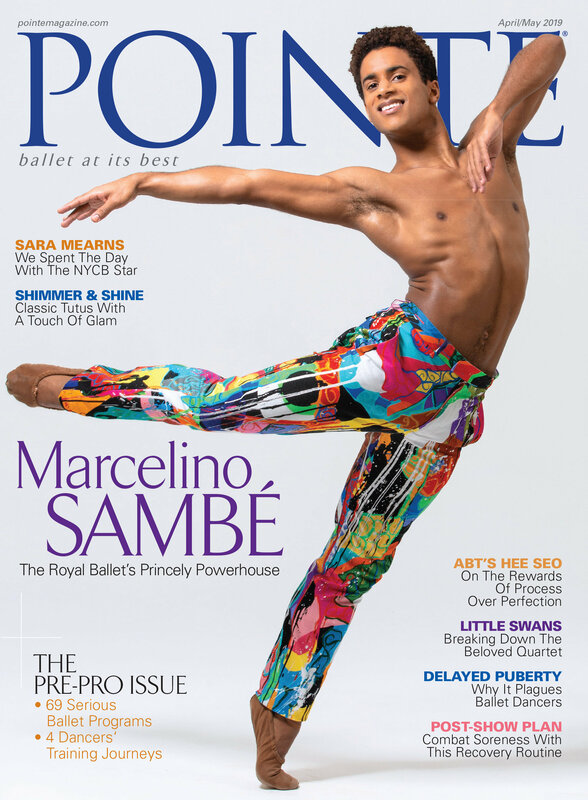 "I don't like anything too flashy," the Joffrey Ballet dancer says, "but I will always have an accent T-shirt, and it's always a cartoon character that is really well known." His collection of shirts features Pokémon, Transformers and Lilo & Stitch, among others. Accents play a role in his streetwear, too. "It depends where the accent color is," he says. "If I pick whiter shoes, then I try to keep my jeans and my upper body a little bit darker, plain. If it's my shirt, then my shoes are going to be much more simple." Calmels gets some of his ideas about fashion from friends he's made in the modeling world. After participating in a Versace campaign in Chicago, he signed with IMG Models. He favors an urban vibe—well-cut leather jackets, classic T-shirts, jeans and sneakers. But even with staple pieces, he has an eye for quality and detail. "I'm looking for cool, slightly different, but still simple," he says. "Not just a plain T-shirt you can find anywhere." For Zhong-Jing Fang, being an artist extends beyond the studio or stage. "Being a ballerina is such a creative thing, and that gives me permission to be creative in my own life," says the American Ballet Theatre corps member, who's known for her collection of whimsical hats. She discovered her love of hats a few years ago while recovering from an ankle injury, when she came across a shop full of them. "I used to go there and try different hats on and the designer would tell me, 'This hat was inspired by Audrey Hepburn,' or 'This was inspired by Liza Minnelli,' " she says. "It gave me an idea that hats can capture some spirits." She enjoys the process of browsing vintage stores and boutiques and crafting her own outfits. In rehearsal, Fang's look varies depending on her mood and the repertoire, but she especially loves practice tutus, leotards with lace and mesh detailing, and French brands like Chacott. "I want to look classic and clean because ballet is such a sculpting art—everything is about lines and sculptures," she says. In or out of the studio, fashion is an opportunity to show her individuality. "I think it's very encouraging for ballerinas to think outside of their box," she says. "It's so inspiring because everyone has different style." "I'm kind of a collector of clothes," says Natalie Varnum. The Houston Ballet corps member turned a spare room in her home into a walk-in closet and fills it with eccentric pieces. "I love big, clear oversized sunglasses; or a high-waisted pant, socks and loafers; or a newsboy hat," she says. Varnum is inspired by icons from the '60s and '70s—Jimi Hendrix, Jane Birkin, Elton John—and she finds endless ideas on social media. She'll search Pinterest for photos, follow up-and-coming stylists on Instagram or update her own blog with "outfit of the day" posts. It was through Instagram that she recently met South Korea–based designer Sandra Meynier Kang, who reached out in hopes of collaborating and sent her a sample from her new leotard line. "It's the best way to make faraway friends now," Varnum says. In the studio, Varnum takes a more conventional approach—sometimes. "I like a classic ballerina look, like light pink, long sleeves," she says, "or I go for something completely crazy." She commissions fun patterned leotards from her friend, former company dancer Jordan Reed, who now runs Lone Reed Designs. Her collection includes leos printed with pizza and doughnuts. Whatever she's wearing, Varnum is not afraid to stand out. "There's a time and place for a classic little black dress," she says, "but I tend to go for the more out-there pieces and colors." Why darn your pointe shoes? The Joffrey Ballet's Victoria Jaiani finds that darning gives her shoes a slightly bigger platform and harder tip, and helps them last longer through demanding ballets. We asked her to share her secrets with us.